If a party disagrees with a ruling of the Ninth District Court of Appeals, the case can be appealed to the Ohio Supreme Court. 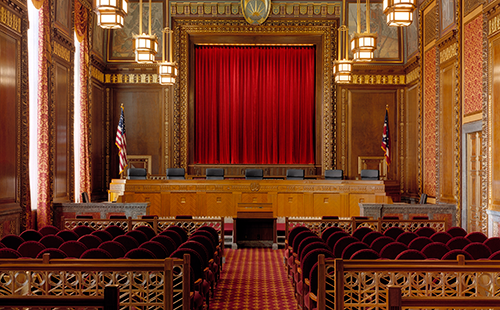 The Ohio Supreme Court has a limited jurisdiction and may accept or decline an appeal in cases where (1) they involve substantial constitutional questions; (2) they are of great public or general interest; (3) there are conflicting opinions from two or more courts of appeals on a relevant issue; or (4) the death penalty has been imposed. If the Ohio Supreme Court grants jurisdiction in a particular case the parties will then file appellate briefs and the case will proceed to oral argument. Oral arguments for the Ohio Supreme Court are held in the Ohio Judicial Center in Columbus, Ohio. In 2014, the Appellate Division was involved in 6 cases in the Ohio Supreme Court. Of particular significance, in 2011, the Appellate Division successfully argued the constitutionality of Ohio’s Disorderly Conduct statute before the Ohio Supreme Court. In State v. Carrick, 2012-Ohio-608, in a unanimous decision written by Justice Cupp, the Supreme Court of Ohio upheld the constitutionality of R.C. 2917.11(A)(2), which states that “No person shall recklessly cause inconvenience, annoyance, or alarm to another by…[m]aking unreasonable noise…” The Court found the law was not unconstitutionally vague, because the statute incorporates an objective standard to impose liability.